Ever Wonder How To Move From Expensive Print Advertising To Online Advertising? 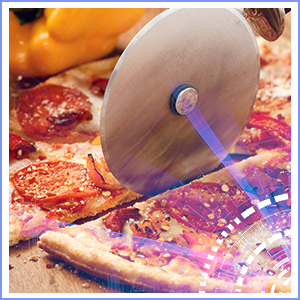 Click Play On The Video and See What the Pizza Marketing Machine Is All About! Deliciously steaming, cheesy and delectable pizza is exactly what you love serving to your customers. Who doesn’t love to see the look of delight on their faces when a pizza is placed in front of them or when they pick up that stack of boxes to take home to enjoy? Pizza is one of the great American foods that everyone can find some commonality in. Whether you have a small child who will only eat cheese or an adult who only eats vegetarian gluten-free, everyone can enjoy a pie filled with fresh ingredients, homemade sauce, and freshly grated cheese. While the origins of pizza aren’t fully American, many restaurants, bars, and chains have adapted pizza as one of their main dishes and they take pride in perfecting the recipe so they can draw in the crowds. the pizza place they know because they already can taste what they want to eat. Trying a new pizza place can be a little more difficult because the customers aren’t sure if you’ll have that Hawaiian pizza with dollops of cream cheese. The hesitation that potential customers might exhibit can be deterred by one simple method: effective advertising. Effective advertising is a great way to draw in the masses, get the word out about how amazing your pizza is, and why it’s an essential place to stop en route from work or on a Saturday night. At That’s Biz, we specialize in effective advertising for pizza places. 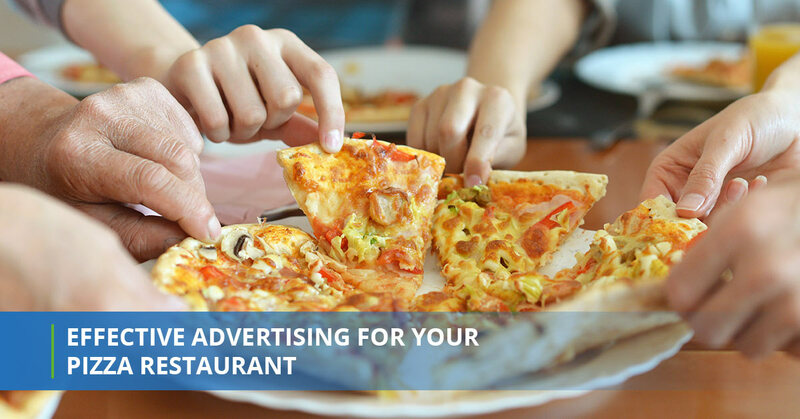 With so many pizza places to pick from all across the country, no matter where you reside, it’s vital that you advertise efficiently and differently than your competition. After all, what do you have that other restaurants, bars, or chains that serve pizza don’t have? For instance, do you have a specialty pizza that just drives people wild with enthusiasm? Do you offer a special deal after seven o’clock on a Wednesday night? What sets you apart and how can you get the word out there that your pizza needs to be eaten by the masses? This is where we come in at That’s Biz. While you’re a pizza expert, we’re the effective advertising experts. We understand what you need as a restaurant, chain, or bar to effectively market your pizza place. 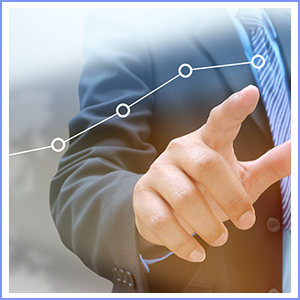 We have a variety of services that will help you stay within your budget and target your desired audiences better. If you’d like to work with a restaurant, chain, or bar advertising company, then take the time to contact us to get started. In 2007, That’s Biz was founded with a desire to help restaurants, chains, and bars create effective advertising methods for their establishments. We do this by providing effective digital marketing solutions that are just for your establishment. This means that we’ll deliver on the cost-effective advertising that is meant to make the marketing solutions for your establishment easier and much more efficient. We’ll help you understand exactly what you need, which will allow you to spend less time on the marketing aspects and more on your establishment. We’ll also help to leverage new types of digital solutions and other social platforms, which will help you reach your goals. In addition, we excel in customer service and we understand what you need to get the results in your restaurant that you’ve always wanted. We offer many different services at That’s Biz. Our main goal is to make advertising more effective and easier. 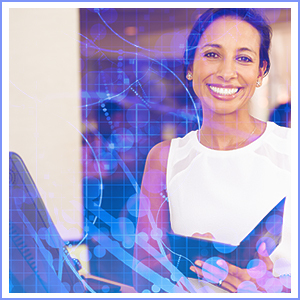 We understand that you’d like to focus on your business and making it flourish. You have an idea in your mind for what you want your business to be and one of the ways you can get there is by participating in effective marketing methods. By talking to an expert and figuring out what’s the right solution for you, we’ll be able to help you target your desired audience and get you the results you want. Below you’ll find our services. 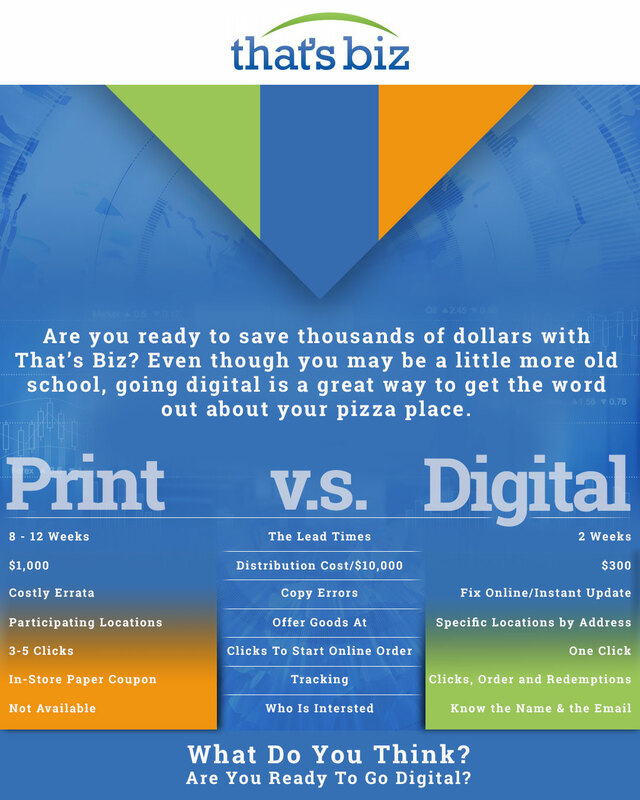 Digital flyers are one of the most popular ways that pizza places get our their message about their establishment. Digital flyers are lower costs, provide better tracking, and have better targeting for your desired audiences. Instead of spending more money on your advertising methods, save gobs of money by promoting digital flyers on the Internet. Not only will you beat our your pizza competitors, you’ll save money, save on postage, and save on production. What’s better than beating out the competition while also saving on cash? Pretty much nothing in our opinion! With digital flyers you can expect to track the number of views, the coupons that were seen, redeemed coupons, who the person was that places an online order, who had the coupon when they stopped in, and the types of offers that someone was interested in. You also will have automatic notifications that will keep you notified on who is interested in your coupon flyers as well as the ability to build up your audience due to digital tracking. Digital flyers can do a lot, but do you know all the ways that they benefit your pizza restaurant? Probably not, which is why we are going to dive into how exactly you can take advantage and blow your competition out of the water with digital flyers. If you’re a little more old school, then these benefits will be just the trick to change your mind when you see how much money you save. Now that you know what a digital flyer is, it’s time to look at exactly how you can help your restaurant be better than the others in your area. When you are using print, your customers will be limited to one use per coupon, which costs you more money. With digital flyers, you can have your customers take advantage of an unlimited use of the coupon, several, or just one. It’s your choice depending on the deal you want to implement. In addition, your customers won’t have to worry about them getting lost in the shuffle. Smartphones are something that most of the population in the world own. If someone doesn’t have a smartphone, then they know someone who does. What’s neat about digital flyers is that they are smartphone friendly and thus your customers won’t ever worry about losing it because it never leaves their hands. A smartphone is glued to a person and they’ll constantly see new information about your restaurant and the offers they can take advantage of. When it comes to smartphones, you may think that you need to take advantage of an app. That’s not the case! With print flyers, you have to mail them out and waste paper. However, with a digital flyer, you’re probably worried about setting up an app except you can use your website with short URL access or you can use a website widget. If you have no idea how to use technology, then just ask us and we’ll help you. Another benefit is that there’s no ‘at participating locations.’ If you have a pizza restaurant that’s a chain, then you don’t have to worry about sending out coupons for specific locations. The digital flyer will be a more general way to entice consumers to come eat your delicious pizza. If you’d like to make your digital flyers more specific, then that’s always an option. By creating ordering online links or locations with specific deals, then you can change the filters on your digital flyers to get the customers to come to that specific pizza place. What’s neat about digital flyers is that you can pick if you want to be more specific or generalized. If you’re on Facebook, then you can build more of an audience to draw in those pizza lovers. You can create remarketing ads, Facebook pixels, or just some delicious images of pizza that will draw in your customers. After all, no one can resist a cheesy piece of pizza. Tracking is essential because it helps you build up your audience and who you’d like to market to. With our digital flyers you can begin to track the number of views, the coupons they looked at, what was redeemed, where they should place an online order, who had the coupon, and the interests that kept them intrigued by your restaurant. For those who are still understanding effective advertising methods, mobile coupons are extremely beneficial to pizza restaurants. A majority of those who may come to your restaurant come for the great deals. A mobile coupon is an electronic coupon that is exactly the same as a normal coupon, but it’s on the cell phone. A mobile coupon can offer a myriad of benefits such as sales promotions, new pizzas that you might be offering at your restaurant, entertainment that might be occurring at your pizza place, or other ways to attract customers to come to your restaurant. Mobile coupons will save you thousands of dollars, so take advantage of this great method for effective advertising. Are you ready to draw in the masses with guest WiFi services? Guest WiFi is a great addition to any restaurant because your customers will be able to access the Internet and you’ll be able to create a list of people who are interested in your pizza place. Our guest WiFi services will build up your email and your customer list. Install and maintain WiFi services in your restaurant when you choose That’s Biz. Text message marketing is a very popular type of marketing due to being able to reach your subscribers at a much faster rate and in a much bigger quantity. Text message marketing will go directly to your phone and at least 90 to 95 percent of the subscribers will read it in the first 15 minutes. That’s a lot more than a simple piece of print advertising. A text message is something that will linger in the subscriber’s phone, and, when you include images, you’ll be able to entice those subscribers and turn them into customers who want to enjoy delicious food. Another service that we offer is digital postcards. Digital postcards are different than flyers and they are better than direct mail. Direct mail will only reach a little over 2,000 people’s homes whereas digital postcards will be seen by at least 25,000 people who are prospects to come to your restaurant. In addition, digital postcards can be linked up to what works best for your restaurant’s schedule instead of the arrival time being determined by the USPS® Mail system. Lastly, a digital postcard will make a bigger impression. Lastly, we offer Facebook Ads. For those who are newer to effective methods of advertising, Facebook Ads can help build awareness about your brand. In addition, your restaurant will be much more at the forefront of someone’s mind because they are seeing it constantly on Facebook due to the ads. By building awareness, you can stay ahead of the competition and draw in different types of customers. Facebook can help you get the information you want to your customers. It will also help you grow your revenue and encourage people to come to your pizza place for specific items that are on your menu. When you post those delicious pizza pictures, your customers will start to feel hungry for delicious pizza.